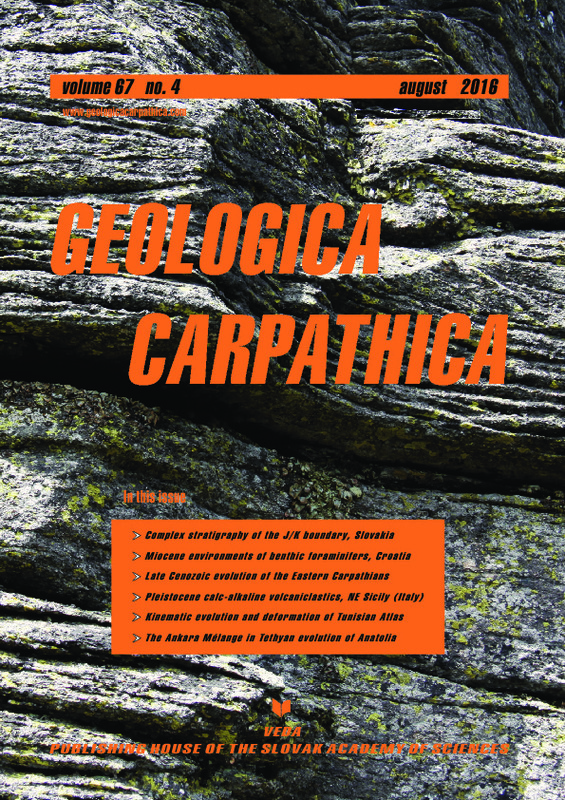 Abstract: A well preserved Upper Tithonian–Lower Berriasian Strapkova sequence of hemipelagic limestones improves our understanding of environmental changes occurring at the Jurassic/Cretaceous boundary in the Western Carpathians. Three dinoflagellate and four calpionellid zones have been recognized in the section. The onset of the Alpina Subzone of the standard Calpionella Zone, used as a marker of the Jurassic/Cretaceous boundary is defined by morphological change of Calpionella alpina tests. Calpionellids and calcified radiolarians numerically dominate in microplankton assemblages. The first occurrence of Nannoconus wintereri indicates the beginning of the nannofossil zone NJT 17b Subzone. The FO of Nannoconus steinmannii minor was documented in the lowermost part of the Alpina Subzone. This co-occurrence of calpionellid and nannoplankton events along the J/K boundary transition is typical of other Tethyan sections. Correlation of calcareous microplankton, of stable isotopes (C, O), and TOC/CaCO3 data distribution was used in the characterization of the J/K boundary interval. δ13C values (from +1.09 to 1.44 ‰ VPDB) do not show any temporal trends and thus show a relatively balanced carbon-cycle regime in sea water across the Jurassic/Cretaceous boundary. The presence of radiolarian laminites, interpreted as contourites, and relatively high levels of bioturbation in the Berriasian prove oxygenation events of bottom waters. The lower part of the Crassicolaria Zone (up to the middle part of the Intermedia Subzone) correlates with the M19r magnetozone. The M19n magnetozone includes not only the upper part of the Crassicollaria Zone and lower part of the Alpina Subzone but also the FO of Nannoconus wintereri and Nannoconus steinmannii minor. The reverse Brodno magnetosubzone (M19n1r) was identified in the uppermost part of M19n. The top of M18r and M18n magnetozones are located in the upper part of the Alpina Subzone and in the middle part of the Ferasini Subzone, respectively. The Ferasini/Elliptica subzonal boundary is located in the lowermost part of the M17r magnetozone. A little bit higher in the M17r magnetozone the FO of Nannoconus steinmannii steinmannii was identified.